What a way to wrap up an impromptu training week. This week I decided to attempt to hit 30 miles. 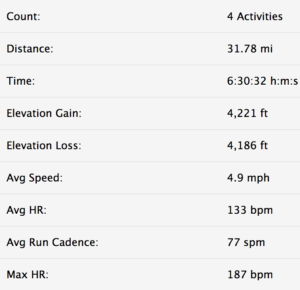 It’s been a long time since I got back in the saddle & ran some decent mileage but I was going to give it a try. The week week went on-and-on but I was not able to break out for any lunch runs and when I got home i certainly did not feel like going out on any runs. Soooo that left a short amount of time to hit the target. Luckily my Ben was up for a nice Sat run & I was able to squeak out a decent Sunday run.